In the wake of the Easter Rising, British Prime Minister Lloyd George summoned a convention of representative Irishmen to try to solve the ‘Irish question’. The Convention was first suggested by Lloyd George in May 1917 as a way to break the deadlock around the issue of Home Rule for Ireland. Its membership comprised of the following categories; Government nominees (15 members), Irish episcopate (7), Irish Party (5), Ulster Party (5), Irish peers (2), Southern Unionists (5), Lord Mayors and Mayors (6), County Council delegates (32), Urban district councils (8), Chambers of Commerce (3) and Labour delegates (7) Sinn Fein (members did not attend). From the outset, intentions, reservations and expectations differed considerably. The Nationalist MPs T P O’Connor and Stephen Gwynn came to the conclusion that a Conference might be the Irish Party’s only hope of salvation. The Irish Convention was invited to Cork by the Lord Mayor, Thomas C Butterfield. The Cork meeting, the first to be held outside Dublin, was held on Tuesday 24, Wednesday 25 and Thursday 26 September 1917. The debate was held at the Crawford Technical Institute at Sharman Crawford Street. The majority of the delegates reached the city on the evening of 24 September by a special train which left Kingsbridge, Dublin at 2 o’clock, and completed the journey in three hours. Between Dublin and Cork one stop was made â€“ it was at Thurles, where Bishop Harty, Archbishop of Cashel, joined the train. 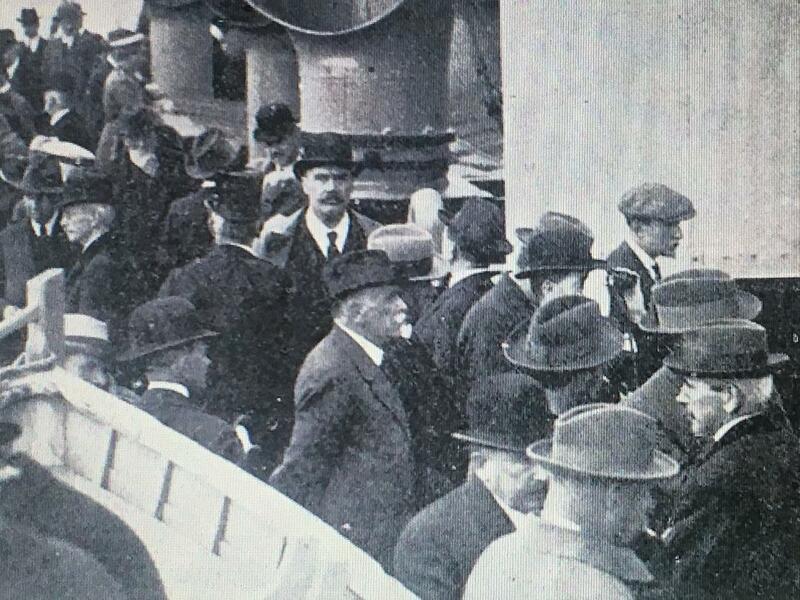 At the Glanmire terminus in Cork the delegates were received by the Lord Mayor and members of the Cork Reception Committee, and escorted to motor cars in waiting outside the main building of the railway station. The delegates were motored to their lodgings during their stay in Cork. MPs John Redmond and J Devlin did not travel by the special train but reached Cork by motor car shortly after six o’clock. Though no public announcement had been made regarding the delegates’ arrival in the city, a large crowd assembled inside and outside of the station, and extended to the distinguished visitors a very cordial welcome. Three days were allotted to the Cork Convention, and hopes ran high that the visit would help delegates acquire a grasp of political leanings and its challenges in the south of Ireland. Every effort was made by the public boards of the city to impress the visitors. Indeed, one of the recreational activities was heading down the harbour and viewing the Lord Mayor engage in the Throwing of the Dart ceremony. One hundred years ago, the ceremony was performed every three years, and was always regarded with interest by Corkonians. A distinguished company always joined the Lord Mayor in asserting the ancient rights of the Mayor as admiral over the port. The City of Cork Steam Packet Company’s fine steamer, SS Inniscarra left the Custom House quay about l pm. The Inniscarra, which had a gross tonnage of 1,412, was built at Newcastle by Wigham Richardson, and Co. in 1903. In making the journey down the river the visitors admired the scenery of the river and the buildings and histories on each river bank each with their own narrative of the ancient past, change, struggle and opportunity within the Cork region. Spectators noted with interest the preparation work ongoing for the Ford Factory, passed through the sweeping spaciousness of Lough Mahon, admired the big houses and woodlands at Glanmire on the one side and Rochestown on the other. They were inspired by the dockyards at Passage, Rushbrook, and Haulbowline. It was 2pm when the steamer, decked with flags, passed by Queenstown, and the visitor enjoyed the beautiful peal of bells in St Colman’s Cathedral. American and English destroyers, and various other craft moored in the harbour, were also objects of discussion. As the ship journeyed out past Roche’s Point, the civic procession made its way to the bow of the ship. There the Lord Mayor, in his robes of office, and wearing the Mayoral Chain, took the Dart in his hand, and saying: “In assertion of the ancient rights of the Lord Mayor and citizens of Cork over all places in and to which the sea ebbs and flows between Cork Head and the Western part of the Port of Cork, and Poer Head on the Eastern part of the, same port, and as far as the Castle of Carrigrohane on the western side of the City of Cork. I now cast this Dart,” he threw the javelin into the sea. 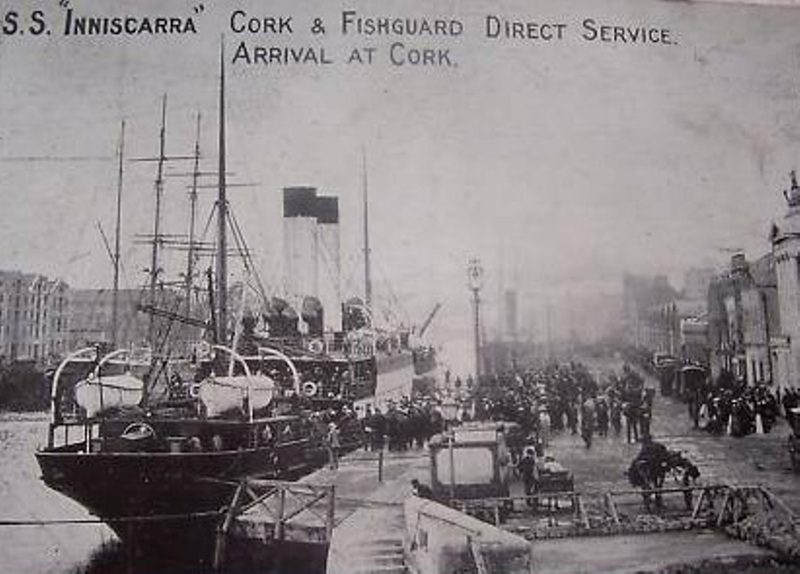 Ironically eight months later, on 28 May 1918, news broke that the SS Inniscarra bound from Fishguard to Cork had been sunk by a German submarine. All on board were lost except the captain the chief engineer and three seamen who were landed at Queenstown. The captain was injured. The remaining 37 men who were on board went missing. The vessel sank within a very short time after being torpedoed and some of the ropes attached to one of the boats got entangled and the occupants were thrown into the water. One of the survivors succeeded in getting into a boat and was taken on board the submarine. Another reached a raft.